Many people want to be modern and use template that is built on contemporary architecture. Based on a straight, centered layout the main labels and titles are set to be in the center of the action. Page width title backgrounds that are enhanced on the top and bottom with complimentary borders speaks to the current trends. The widths of the backgrounds can be changed if you change the font size on the page. If you like this template and would like to have just the borders with no backgrounds, make the accent color white so it blends into the page and doesn't show the color. To achieve the greatest level of optimization with this contemporary template various aspects of it can be customized to finish with the most effective resume possible. Optimizations such as the best sorting order of the sections, discovering the best formatting scheme for your situation and checking for spelling errors and grammar errors. It is important to optimize what you write. Arbitrarily putting words on a page doesn't benefit anyone. You will need to think about what you are writing and make what you can offer to the employer known. Even if you don't have the exact set of skills they want you can still write them in a way that best fits their requirements. We have plenty of tips and examples you can copy and learn from to greatly improve your writing. Don't forget to run our Spell Checker where the feature is available. 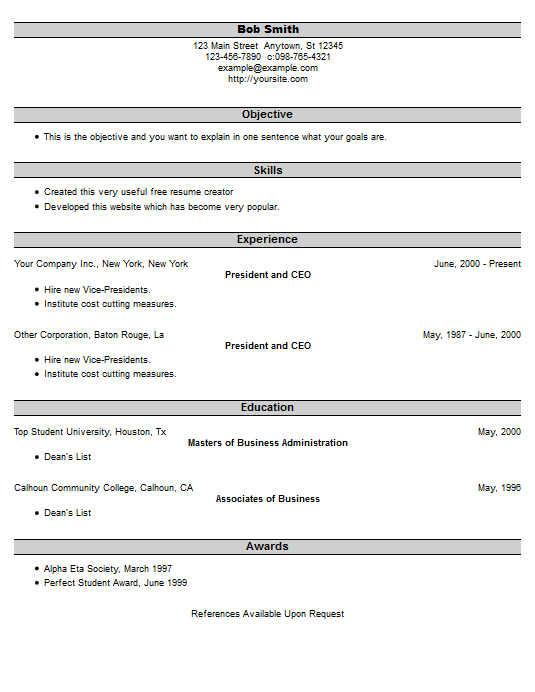 We are pleased to give out this template free of charge to anyone who needs it to get a job. Create your resume then download (export) it from the system. Use the link on the top right of this page.